I love mixing patterns, especially when it comes to plaid. This painter tee is a pretty basic, striped top, but the gold zippers on the shoulder give it a little something extra. We took these photos beside the Country Music Center, right in the middle of downtown Nashville. Exploring and taking in all the history and memorabilia in the city is so fascinating to me. The start of fall, the nostalgia of an amazing city and the best company, all made for the perfect weekend. As I mentioned in Monday's post, it was so chilly in Nashville, so I was thankful to have layers! This is definitely one of my favorite, casual outfits for the season. I'm sure I'll be pattern mixing a lot more with these fall staples. Classic look, I love your boots. I love this scarf paired with the blue and white striped top. I have almost the exact same pieces, I think that I will have to "borrow" this look. Thanks for the inspiration! Perfect look for exploring Nashville! We're headed there this weekend and I'm definitely taking your advice into consideration when packing... bring layers! This is the perfect fall look!! 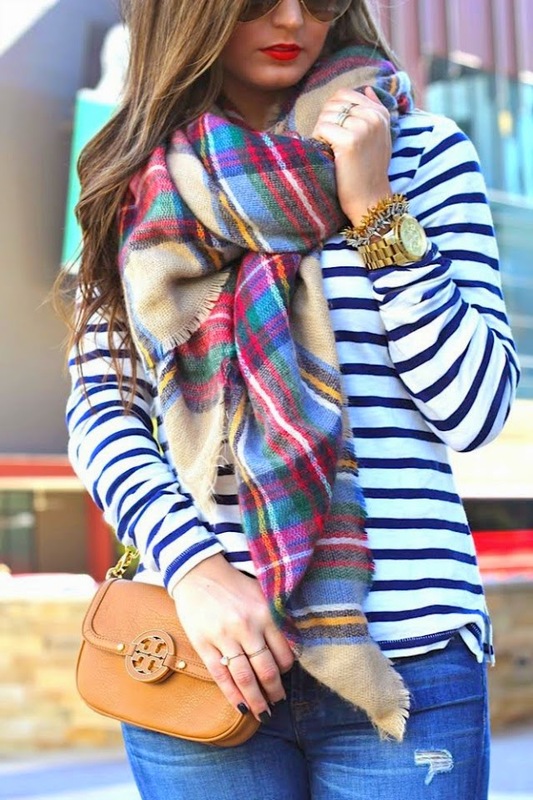 I love the stripes and plaid scarf paired together! The brown accessories are perfect! I love it! 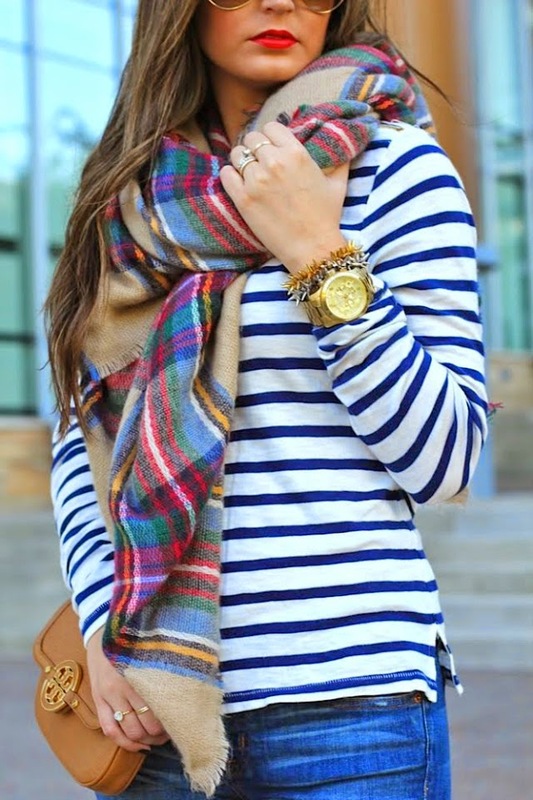 Love the stripes + plaid!! In love with your striped Jcrew top! Absolutely the perfect fall outfit! I am inspired now to wear a striped tee with my scarf now! thanks for the inspiration :) I just recently got a scarf like this and been wanting to try new ways to style it! Perfect fall outfit! I love it! Love your stripes, and cute cross body bag. So cute!!!! This outfit just about sums up what I love about fall, I love your style! This is a go-to look of mine - I LOVE FALL! I love that scarf and need it yesterday. Can't go wrong with stripes and plaid! You look fab! Love the scarf but it's sold out on nasty gal :( can you share the brand so I can look for it elsewhere?